Bao Hailu,Naxi nationality, born in 1994 in a small village inbetween Lijiang and Shangri-la.He was born with great hope and care of the whole family since he is a boy after allready got a elder girl one year ago.Birthing a boy is considered as the most important thing since a boy could inherit the family and to take care the aged parents(Chinese farmers have no pension) in the fulture.So little Bao was given a very great name Hailu (Hai which meas ocean,Lu meas Road or way,Hailu means little bao will be success in anyway in the fulture)and 100% taken cared and loved by every as other boys in the village.He was so lovely,smart,strong in the famlies' heart. Unfortunately,the whole family was involved into a kind of life of saddness and hopeless 3 years later after little Bao was born. He allready could walk well, but start to be lame and weak day by day ,even could not stand up normally lastly. His parents (who are almost illiterate)"Little Bao's spitit was take away by some evil gods"some old people in the village said.Shamen was invited from all neighbor regions to pray for him to stand up and walk hearlthly.But it did not works.Lastly little Bao was taken to the Municipal hospital and there his problem was told to be poliomyelitis,but it seems to be a little late.His family spent all the income each year taking him to different doctors, lastly little stand up with a stick.Little Bao was also sent to school,but stopped after elementary school since he could not take care of himself to stay in the dormitory in the boarding school which is far from his home. He stayed at home and was encouraged and tought by his parents to walk bravelly,to cook,and to be self-dependent.Little Bao did great job and was respected by all the villagers. Little Bao has very strong spirit.He was looking for a skill to earn his living all these years,but his village is really too small to offer any things fit for him.Fortunately,one leader who knew Baisha Naxi Embroidery Institute went to his village for investigation and introduced his family that little Bao could come to study Embroidery if he like. 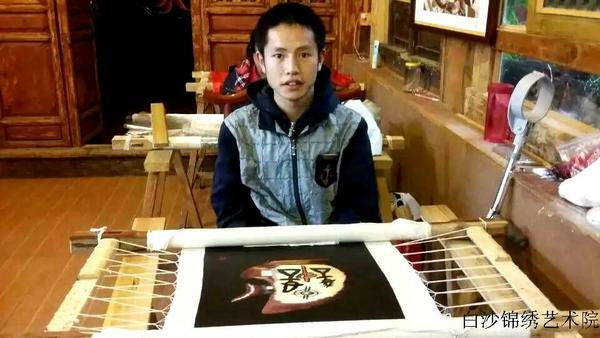 Little Bao was very excited to hear this great news and required his parents to take him to the Institute in March,2015.After a training and study in the past year, now he could embroider some work by himself and is employed as embroider(also study as a senior student) by the Institute. 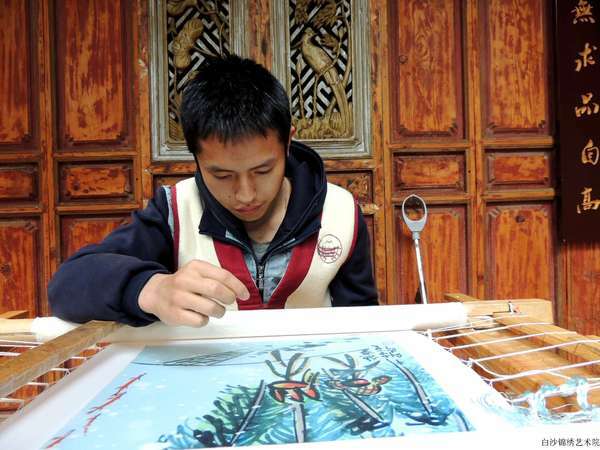 He found his value in the institute and become even more independent, confident and positive! 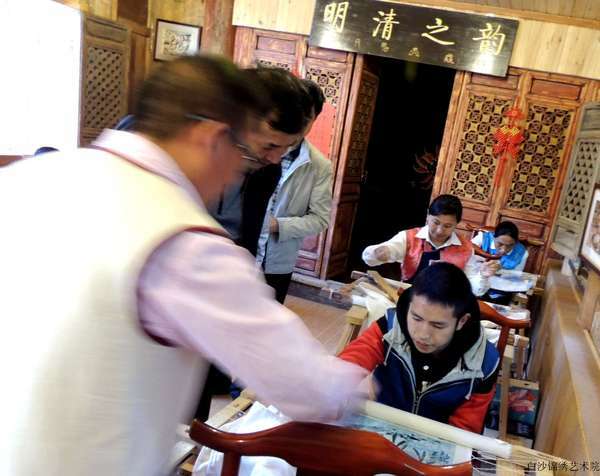 He gets up very early to practise Taiji before starting embroidery, and keep reading every evening. He does not go home except it is really necassary." I want to learn more, work more, i want to do the same as others, i belive i could do it.....I get a new life here, i am very happy......I am very happy here with the respects from all around... I feel very successful within finishing another embroidery work!...... "Little Bao said.